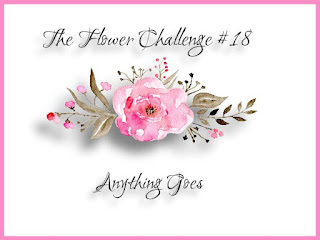 Once again we've come to the half point at THE FLOWER CHALLENGE "Anything Goes" Challenge. I want to remind you that we have a fabulous prize for one lucky winner in the form of 2 amazingly beautiful digital images from the very talented EunJi Jung who has donated them for you. This is the card I made with one of them. I printed this image onto a piece of Blick Studio Drawing Paper. This paper is perfect for coloring and blending with Prismacolor pencils, which is what I did to color my flowers. I didn't want to add any pattern paper or colored card stock to this flowers, so all I did is add this frame I found on my stash of left over die cuts after I sponged it a bit with Tumbled Glass distress ink. After I finish coloring this bouquet I fussy cut it and placed it on my card base with foam dimensionals. I added gold gel pen to the centers and the stamens and a bit of Wink of Stella to all the petals. I die cut the sentiment with gold card stock and stamped the smaller sentiment with Royal Blue ink. The border on the top is from a SU set called "Delicate Details", sentiment is from an old Flourishes set called "Zinnias", the flower in the corner is from the same digital images, I colored and fussy cut it the same way as the one on the front panel. So I hope you feel inspire to join my teammates and I in THE FLOWER CHALLENGE gallery, be sure to stop by their blogs to see their amazing creations. One more thing, we are having a Design Team Call this month so, if you want to be a member of our team, please put DTR (Design Team Request) after your name when you upload your card to the gallery. 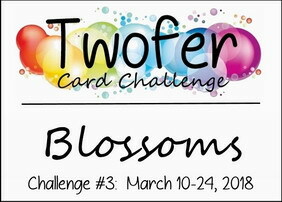 This is a super fabulous group of card makers who are so much fun to work with, you will love it. 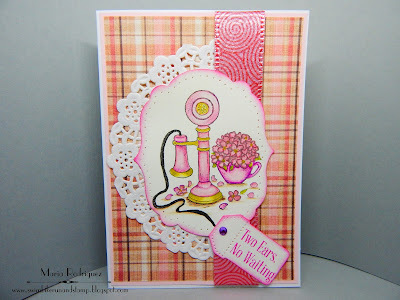 Hello dear stamping friends: I have a card to share with you made with one of the cutest telephone image ever, I love this type of phones, I think they are so romantic and so stylish, no apps on these phones, that's for sure, this particular phone was one of those where you have to ask the operator to connect you with whom ever you were calling, more personal, I think. This image is from a retired Flourishes set called "Call Me", I've had this set for years, perhaps since it came out back in 2012-2013, the other images are just as beautiful. 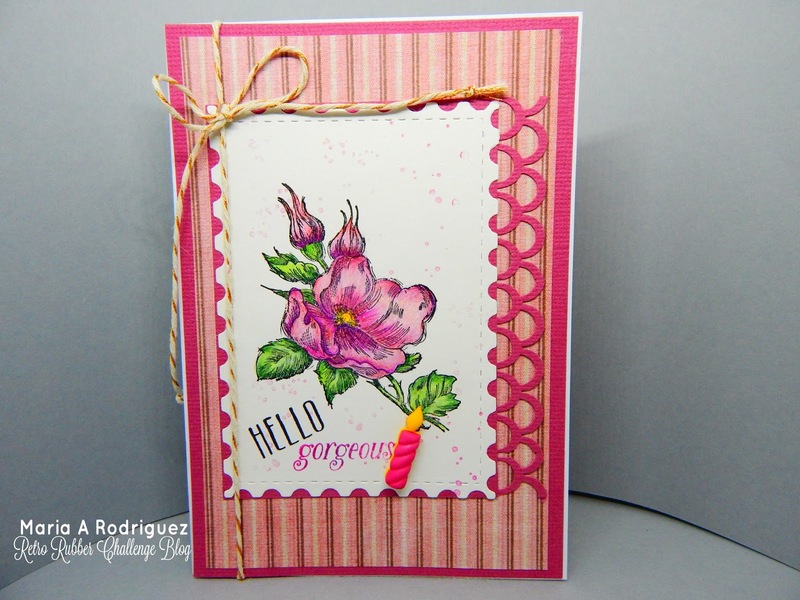 I stamped this one with Stazon black ink on watercolor paper and colored with a SU marker in Pink Pirouette and shaded the images with Prismacolor pencils. I added gold gel pen to parts of the phone to give it a rich look. The sentiment is from the set and the Rhine Stone from my stash. I don't know why it looks purple, I took several pictures with the same result, but I can assure you, IT'S PINK!!! The pattern paper is from a retired line from Lili of the Valley, the ribbon and doily from my stash. 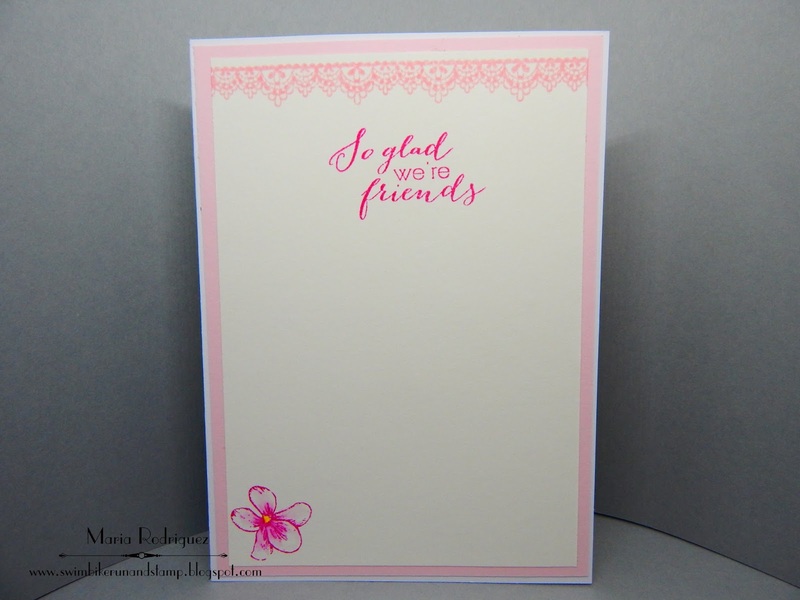 The lacy border is from a SU set called "Delicate Details", the sentiment is from a Power Poppy set called Sassy Succulents, the flower in the corner from a retired Flourishes set called "Sweet Violets". 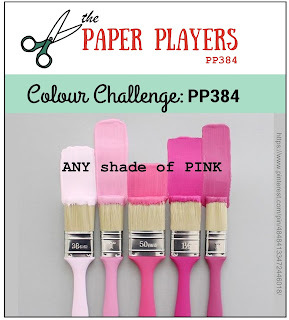 The Paper Players Color Challenge from Joanne. Aurora Wings Challenge #64 "BINGO" I used the first vertical line, "Lace or Doily, Flowers and Ribbon"
Hello everyone: The SHOPPING OUR STASH challenge has a new one for you to have fun with, this time our theme is "Put a Bird on It", any bird so go and search your stash and come and join my teammates and I in our gallery, here is my inspiration card for you. I had this cute little chickadee in my box of unused Holiday stamps, I think I bought it last September and never even ink it up once, which is a shame because this image is beautiful. 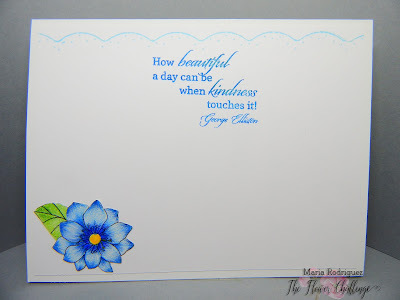 I stamped it on a piece of Blick Drawing paper which I love because it can take water coloring as well as Prismacolors, blending each of this mediums beautifully. I just used black and brown inks and use my pencils for the shadows. 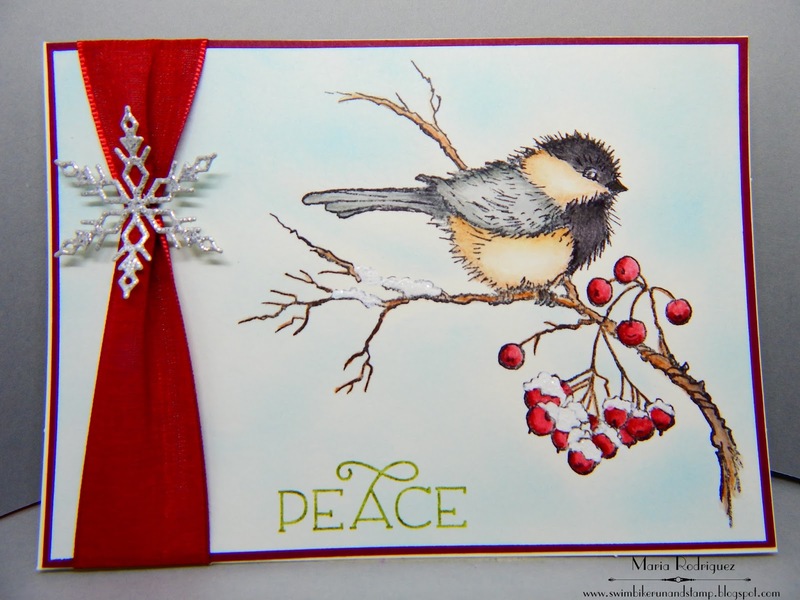 The berries are colored with SU Cherry Cobbler, my favorite shade of red, the PEACE word is inked in Old Olive. I added a bit of white acrylic paint to the snow on the branch and the berries and then, sprinkled a bit of very fine iridescent glitter from Martha Stewart. The ribbon is from my stash, I found the snowflake in my box of left over die cuts. 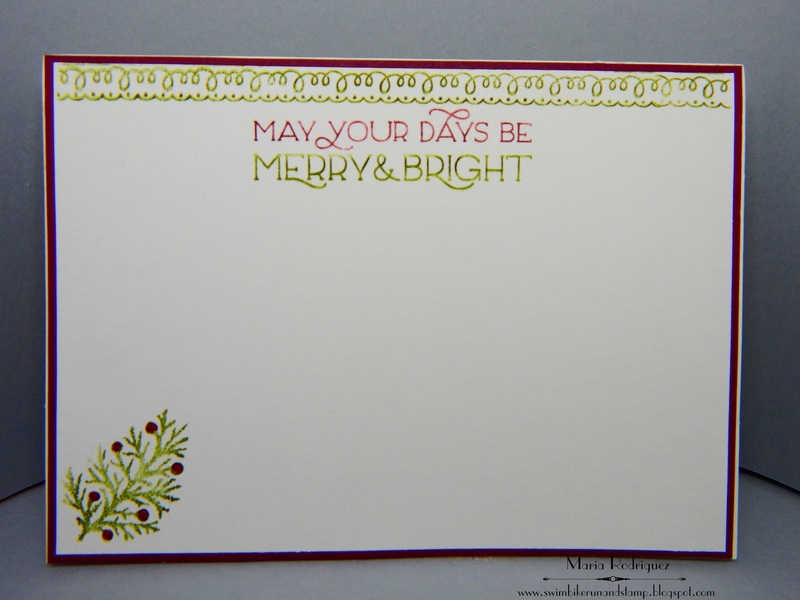 The border is stamped with SU Delicate Details, the sentiment is from a Power Poppy set called Ponsettia and the little branch in the corner from another Power Poppy set called Merry Littles. 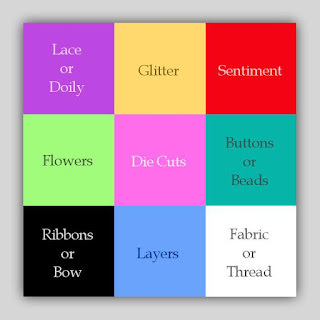 I hope you stop by the SHOPPING OUR STASH blog and play along. For more inspiration check out my teammates beautiful creations. Hello everyone: The RETRO RUBBER challenge has a Tic Tac Toe theme for you to play with, lots of fun and fabulous combinations for you to choose from, so I hope you get inspired and come and join us in our gallery. 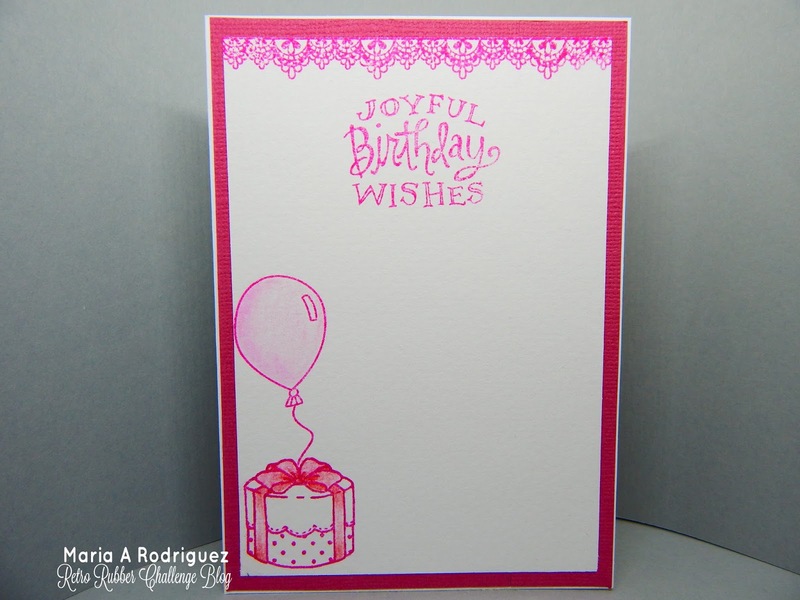 Here is the card I made using the first vertical line, Pink, Twine and Birthday. 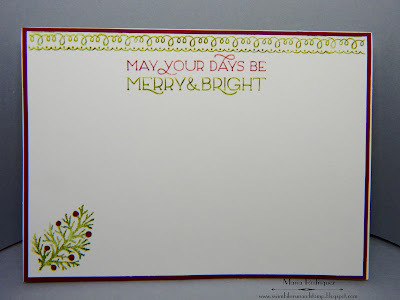 This image is from a retired Stampin' Up! set called "Happiness Shared" that came out back in the 2010-2011 catalog, I bought it right when it came out. The image is stamped with Stazon black ink and colored with SU markers and Prismacolor pencils, I added a bit of splatter with the "Gorgeous Grunge" (2013-2014 retired), the sentiments are from a Power Poppy set called Best Day Ever, the pattern paper is from a retired line from Lili of the Valley, the little birthday candle is a button I bought at the local craft store, the twine from my stash and the decorative border was punched with a Martha Stewart punch. The lacy border is from a retired SU set called "Delicate Details" from the 2017 SAB catalog, the sentiment is from another Power Poppy set called Potted Primroses, the gift box is from a "There She Goes" set called "Wrapped in Joy" and the balloon is from a Hero Arts set called "Happy Today". I really love combining different stamp sets to create my cards. I hope you get inspired to come and join my teammates and I at the RETRO RUBBER gallery. This challenge is a very special one because we are welcoming the fabulously talented LeAnne Pugliese as the newest member of the team, her blog weeinklings is amazing, be sure to go visit, you will be so happy you did. 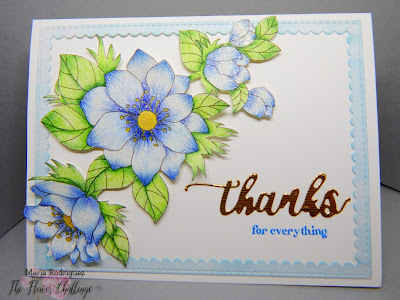 Thank you for sharing with us at RETRO RUBBER, please read our rules, the most important one is that ONE OF THE STAMPS YOU USE IN YOUR CREATION MUST BE AT LEAST ONE YEAR OLD, this challenge blog is dedicated to those older stamps that haven't seen ink in a while and they deserve to shine again. Please include the age of your stamp on your post. 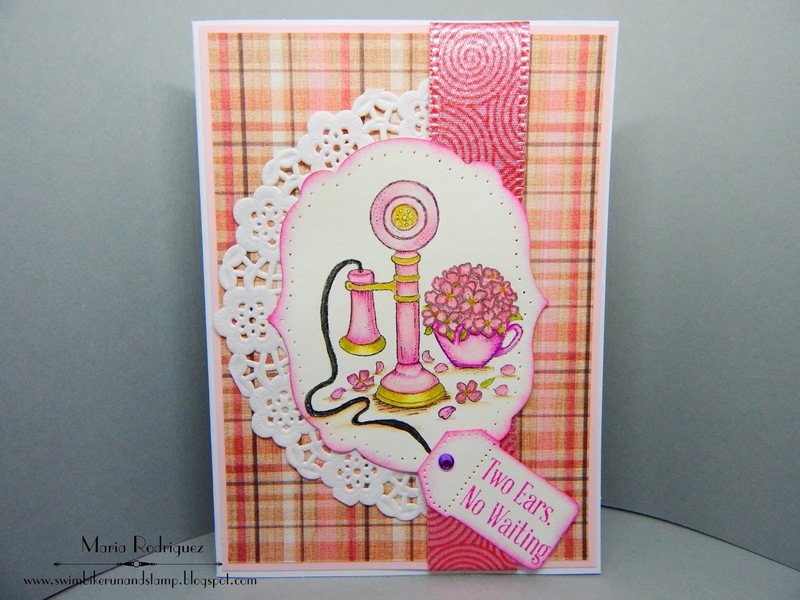 Hello dear blogging friends: You must know by now that there is a fabulous new challenge out there in blog land called the TWOFER CHALLENGE created by the fabulously talented Darnell Knauss, this challenge really makes you use your imagination to come up with two cards that are completely different using the same stamp or die. This is what I created, hope you like them. 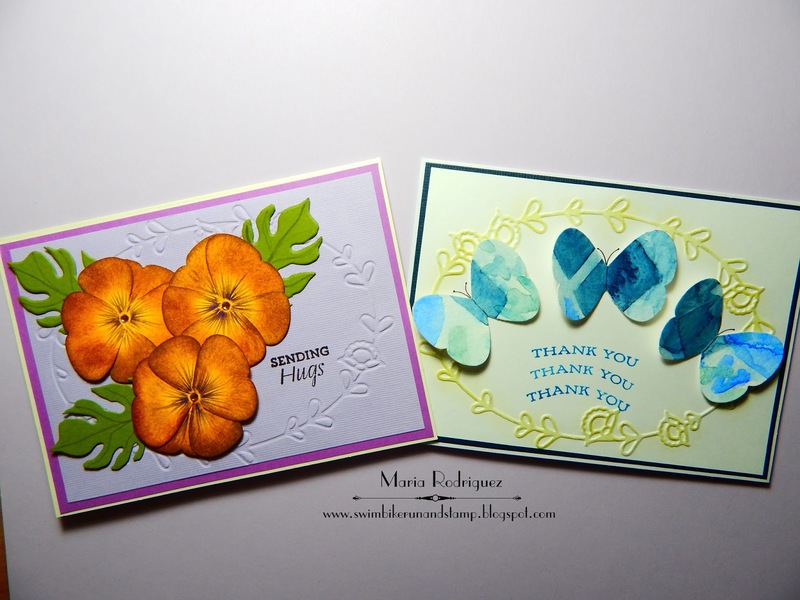 The pansies on the left and the butterflies on the right are made with the Butterfly Punch that coordinates with the "Flight of the Butterfly" stamp set, here is a picture to spark your memory. 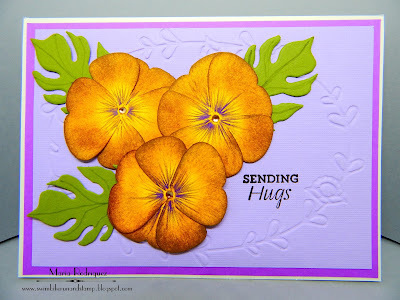 Anywho, the first card was made following THIS TUTORIAL I found on Pinterest, super fabulous how you can actually make this Pansies with this punch. I just sponged some Concord Grapes distress ink on each of the "Petals" that I punched from yellow card stock and made the veins with a dark purple Prismacolor pencil. I added a small golden Rhine Stone for bling, the leaves were die cut with the retired SU "Botanical Blooms"die set. 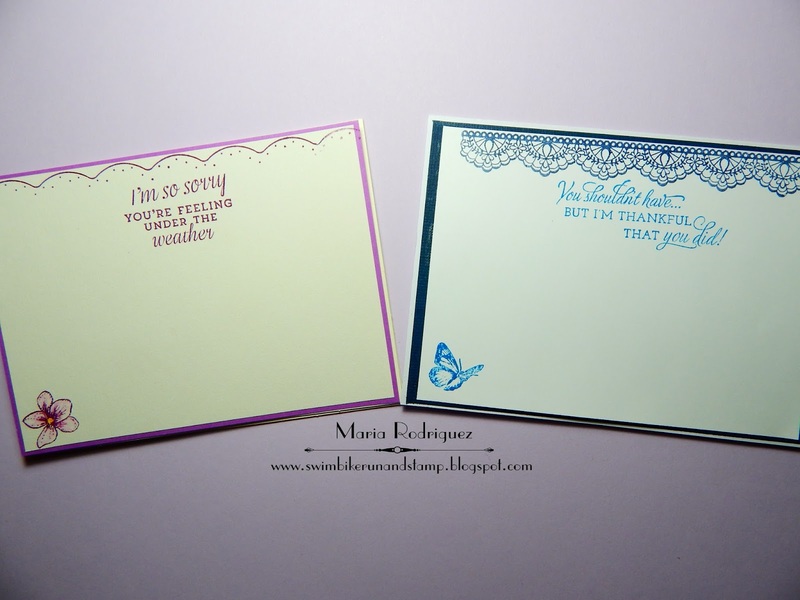 I used an oval SU embossing folder on both cards but I forgot the name of it at the moment. On the second card, I used the punch to punch out 3 butterflies from a piece of watercolor paper my granddaughter Vanessa (almost 20y/o) used to test some inks for one of her amazing paintings. I thought the colors were so beautiful and I knew I was going to use it somehow, I love the way the wings look on those awesome shades of blue. 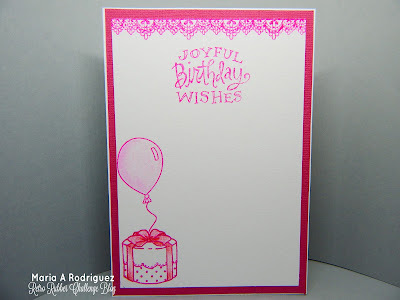 I used the same embossing folder as on the first card. The border on both insides is done with the SU "Delicate Details" stamp set, the sentiment on the left is from a Power Poppy set called DAFODILS, the sentiment on the right is from an old Flourishes set called ""With Gratitude". Here is a little closeup of both front panels on my cards. CRAFTY FRIENDS CHALLENGE #79 "For a Special Lady"
CATCH THE BUG "All Creatures Great and Small"
My Time To Craft Challenge #366 "Easter or Spring"